Latest reports indicate that Indian people continue to be haunted by hunger and malnourishment, with very minor improvement – and even worsening in some cases - over the past few years. Latest reports indicate that Indian people continue to be haunted by hunger and malnourishment, with very minor improvement – and even worsening in some cases - over the past few years. Despite this shocking state of the country’s citizens, ending hunger is not on the agenda of Prime Minister Modi and his pseudo-nationalist government. In fact, his govt. has been cutting funds for essential schemes like the ICDS that provide nutrition to infants and pregnant or nursing mothers. The Modi govt. is thus directly culpable for prevailing hunger. In the last 7 years, the share of population that is undernourished has declined from 16% to 14% according to the Global Hunger Index (GHI) report for 2017. Since population is growing at the rate of nearly 2% per year, this means that the absolute number of hungry and undernourished people in the country is actually growing and stands at about 20 cr, up from about 19.7 cr in 2007. Among children, malnourishment caused by hunger is shockingly high and on some parameters it is worsening. Wasting in children, that is, low weight for height, is a typical symptom of malnutrition. According to the GHI report, prevalence of wasting increased from about 20% in 2006-10 to 21% in 2012-16. That’s about 9.7 cr children. Stunting, which is low height for age, has gone down over the years but prevalence is a whopping 38.4% among children. India has slipped from rank 97 among 120 countries last year to 100 currently in the GHI rankings indicating a worsening of the situation. Among India’s neighbours, Nepal, Sri Lanka and Bangladesh are better than India. Another study of undernourishment published in the medical journal Lancet a few days back shows that about 58% of all boys and 50% of all girls in India are underweight, a clear and unambiguous sign that the bulk of tomorrow’s citizens are severely deprived of food. Lack of balanced nutrition means not just weakness and arrested development of the body but also damage to development of the brain in children. This is a legacy today’s children will carry over the future lives. Put together, all this means that about a quarter of the world’s hungry people live in India, making it the hunger capital of the world. Seen in the context of the fact that 1% of India’s population owns about 50% of wealth in the country the existence of such incredible scale of hunger and malnutrition in India is a damning indictment of the policies followed by successive governments. Under the leadership of Modi, the present government has no plan or policy for ending malnutrition and giving two square meals to the people. These issues are never mentioned by Modi in his homilies on radio and television. The Niti Aayog, the prime minister’s Economic Advisory Council, and apologists for the Modi sarkar in the media or intelligentsia have no thoughts about millions going hungry in the country. 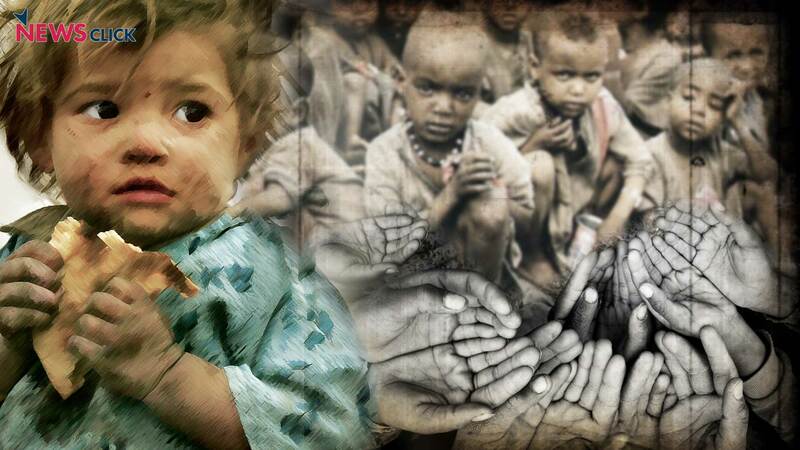 The RSS and their associates have never uttered a single word about hunger. The CII and FICCI, representing big industrialists of the country, too are blind to hunger though they constantly pressurise the govt. for getting more concessions to fill their coffers. The govt. has enough resources to build bullet trains and send spacecrafts to Mars but not to put food on the plates of people. And now, with unemployment growing, job losses threatening across the country and economic activity slowing down due to bankrupt and incompetent leadership in the government, prevailing hunger will grow further. “I am not going to back down until the signatures are paid heed to by the mute and deaf government.